One could argue that data is the lifeblood of any computerized system. 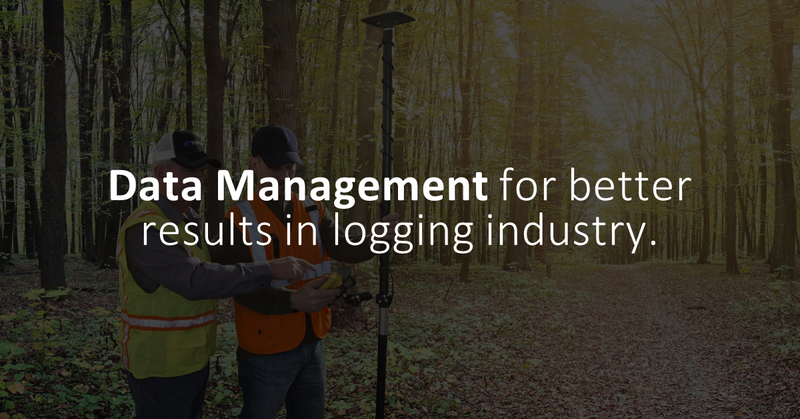 When applied to the forestry and logging industry, you could say that data is the sap running through the digital backend that supports the logging crews. Acquiring information is only half of the process. This information, this data, must be analyzed, refined, and utilized in a way that leads to a successful outcome. The importance of proper data management cannot be understated (and equally, the consequences of not doing so). How data is accessed and processed will determine how the business runs in the short and the long term. The logging lifecycle encompasses a number of elements: scouting the area, determining which -and how many- trees to cut. Then, transporting these logs to the sorting yard, which usually involves hauling on heavy trucks driving on dirty, mountain tracks. Finally, the logs have to delivered to either the mills, where they will be chipped or pulped, or to other businesses to be processed. Every stage of this lifecycle first begins by producing data about the location, quality, and type of tree. Then, during transport data is created about mileage, distance, number of logs per truck, vehicle performance, fuel consumption, etc. While on the sorting yard, even more data and information is produced, about how the logs are sorted, where and how far they are meant to go, and many other factors. The mill then contributes to this cycle of data production by giving information about how many trees are chipped, how many are pulped, what the hourly yield is, energy consumption, and a myriad of other factors. And finally, marketing data has to be obtained and processed, enabling things to go into a whole new level when interacting with the clients’ databases. This is just a brief outline on how much data is produced and gathered during the logging lifecycle. What you do with all the information, how you handle this continuous data stream, will largely determine how well (or how poorly) your operation will function. Some logging operations in remote areas may still rely on pen & paper solutions to keep records, perhaps due to aging staff, reluctance to change, or budgetary constraints. This may work to a degree with small operations where the volume of the business is not excessive. Still, paper records are unreliable because they can easily be tampered with and/or destroyed. There is little room for paper in the digital era. The world is in the midst of the Fourth Industrial Revolution, which brings AI, Big Data, and Digital Transformation together into a melting pot of technological revolution. Data no longer needs to be rubbed out with the eraser at the other end of the pencil. Computers do all the work, but these computers need to know what to do with the data fed into them. It is crucial to manage this data in an effective manner, to ensure its integrity and validity. Effectiveness in this context means both cost-effective, and business-effective. In other words, data management must be done in such a way that it saves money for the business, while also advancing the business’ capabilities. The end goal of every data management tool is to ensure these factors. The importance and relevance of data management cannot be highlighted enough. Managing and validating the vast amounts of data generated by even a single day of work out in the field may appear like a daunting task, but implementing Digital Transformation, evolving into a Big Data environment, and ensuring that your operation is as up to date as it can be will make all the difference in the long run.